288 vacancies. Candidates must have Degree qualification with English Typing Speed of 40 WPM are eligible for this JJA Vacancies. Age of the applicant must be between 18 years to 27 years. Application forms available from 09th November-2017 at http://delhicourts.thc.nic.in/index.html. Interested candidates may go through the official website of Tis Hazari Dist Courts. Open the recruitment tab and search for JJA Vacancies. Submit the filled application before 01-12-2017. Pay Scale for post JJA is Rs. 5200/- to Rs. 20,200/- plus Grade Pay of Rs. 2800/-. Selection of individual for Junior Judiciary Assistant Jobs will be based on written examination, Computer Skill Test and Typing Test. 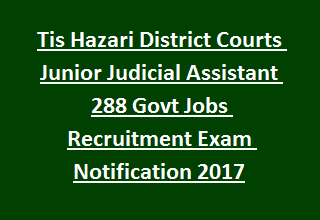 For more details of application procedure, Selection process, Age limits, Pay Scale, Educational Qualifications of Tis Hazari District Courts, Delhi Recruitment, 288 Junior Judicial Assistant Jobs are mentioned below. Total vacancies available in Delhi District Court Tis Hazari Recruitment are 288 posts. Total no of vacancies: 288 posts. Candidate must have degree qualification from any recognized University with English typing speed of 40 WPM. For more details, see the Delhi Dist Courts official notification. Minimum age of the candidates should be above 18 years and maximum age limit should be below 27 years. Relaxations applicable for reserved candidates as per rules. Selection of individual for Junior Judiciary Assistant Jobs will be based on their skills in written examination, Computer Skill Test and Typing Test. Candidates applying for Delhi District Court Tis Hazari recruitment have to visit the official notification for application fee details. Interested candidates have to visit the district website of Tis Hazari http://delhicourts.thc.nic.in/. Click on the recruitment tab and search for Jr Judicial Assistant post. Read the instructions from the official notification and fill the application. Submit the application from through online from 9th November-2017 to 01st December-2017.